The art and literature of the 1890s is one of the strengths of the University’s Special Collections. 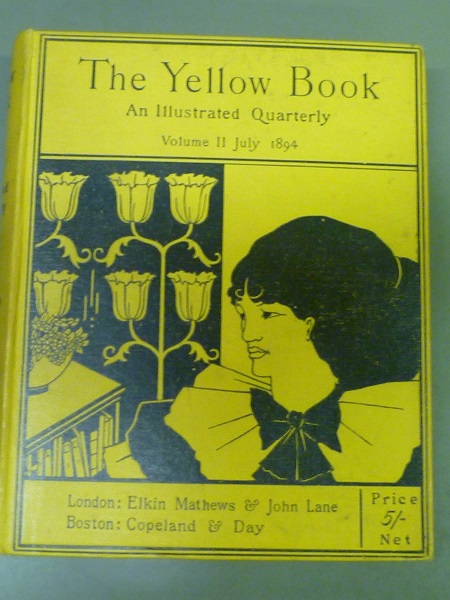 However, although these holdings, along with the popular perception of the 1890s, tend to focus on male figures of the fin-de-siècle period, such as Oscar Wilde, Aubrey Beardsley and the publisher Charles Elkin Mathews, we also hold a number of early or first editions of publications by women writers of the 1890s. These works appeared in book form and also in short stories in avant-garde periodicals such as The Yellow Book and The Savoy (copies of both titles are held in our Reserve Collection). This new writing was often daring, experimental and innovative, dealing with themes such as marital discontent, female sexuality and the literary and artistic aspirations of women. Their work shocked many contemporary critics, who labelled these ‘New Women’ writers as perverse and unnatural and ‘literary degenerates’, and part of the perceived cultural decline of the decadent period. 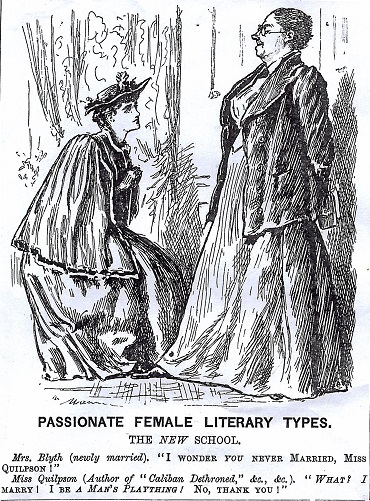 These women writers were often mocked in the press, particularly in the pages of the satirical magazine, Punch, as shown in the cartoon below. One of the key figures among the ‘New Women’ writers was George Egerton, pen name of Mary Chavelita Dunne (1859-1945) . A writer of short stories and plays, she was born in Australia, but was much travelled, living in Ireland, America and Norway before settling in London. Her subject was the lives of working-class women, and her writing was very popular when first published in the 1890s. Egerton’s volume of short stories, entitled Keynotes (1893) [see title-page below of the 1894 edition] was significant for its focus on female sexuality. A second volume, Discords, was published the following year (held in RESERVE–823.89-EGE). We also hold archive material relating to Egerton in the collection of papers of her friend, the poet, bibliographer and bibliophile John Gawsworth (MS 3547). We also hold the papers of Pearl Craigie (1867-1906) (MS 2133). Craigie was the author of a number of plays and novels under the pseudonym John Oliver Hobbes. She was President of the Society of Women Journalists in 1895, and also a member of the Anti-Suffrage League. Women writers of the period were often overlooked as they often preferred to write short stories rather than full-length novels. The short story format offered move flexibility and freedom from traditional Victorian plots, which as the critic Elaine Showalter notes “invariably ended in the heroine’s marriage or her death. In contrast to the sprawling three-decker, the short story emphasised psychological intensity and formal innovation”. 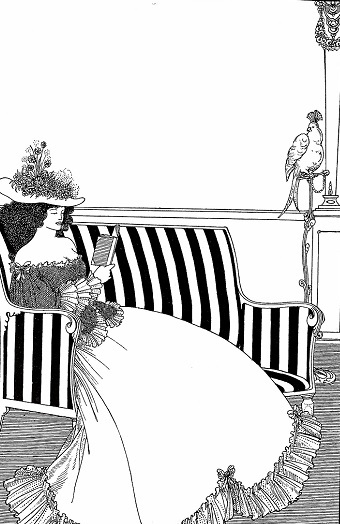 The short story was seen by women writers as an opportunity to explore the psychology of women. As Egerton wrote: “I realised that in literature, everything had been better done by man than woman could hope to emulate. There was only one small plot left for her to tell: the terra incognita of herself, as she knew herself to be, not as man liked to imagine her – in a word, to give herself away, as man had given himself in his writings”. Titles mentioned in this post are available to view on request in the Special Collections Service reading room. Gawsworth, John. Ten contemporaries : notes toward their definitive bibliography. (London : Ernest Benn Ltd., ). 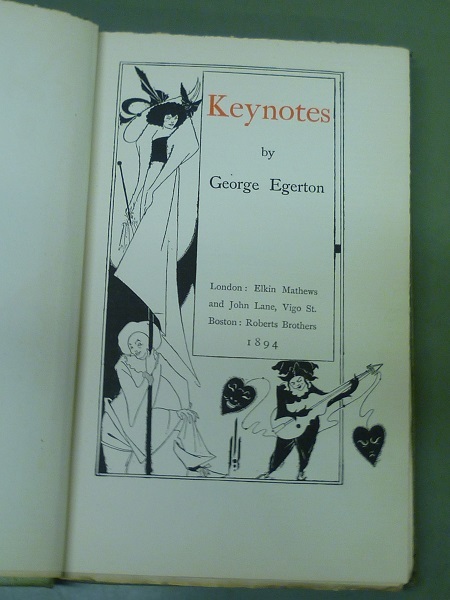 Reference copy held at Special Collections Service: MARK LONGMAN LIBRARY–016.82-GAW and copy held at the University Library: STORE–28802 (Includes ‘A keynote to “Keynotes” by George Egerton). Heilmann, Ann. New woman strategies : Sarah Grand, Olive Schreiner, Mona Caird. (Manchester : Manchester University Press, 2004). Copy held at the University Library: 823.8-HEI/3rd Floor. Krishnamurti, G. Women writers of the 1890’s. (London : Henry Sotheran Limited, 1991). 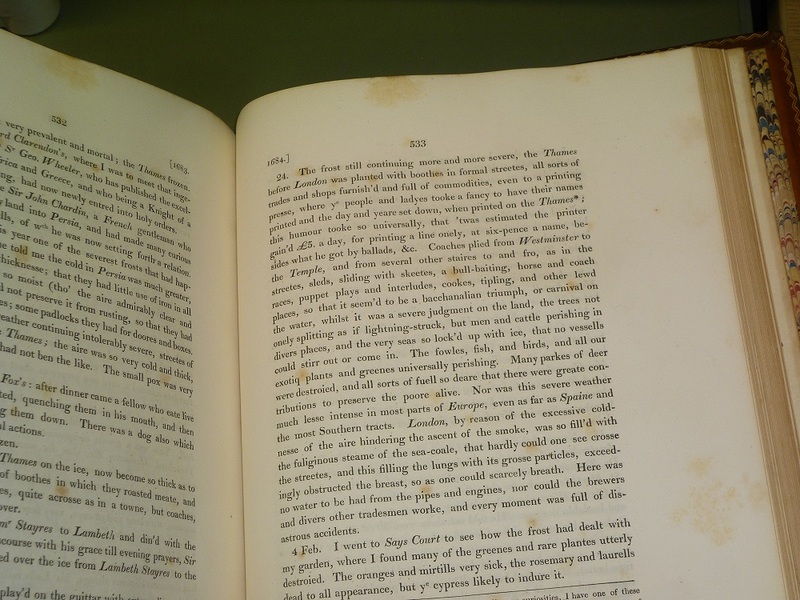 Reference copy held at Special Collections Service: 820.99287-WOM and copy held at the University Library: 820.908-KRI/3rd Floor. Showalter, Elaine (ed.) Daughters of decadence : women writers of the fin de siècle. (London : Virago, 1993). Copy held at the University Library: 808.8-DAU/3rd Floor. Edward Bawden’s cover design for The Flight from the Enchanter (Ref. CW AW/M/40). The publishing archives of Chatto and Windus provide a fascinating insight into the process which brings a new book to its readers, allowing us to see the interplay between the literary and commercial worlds. 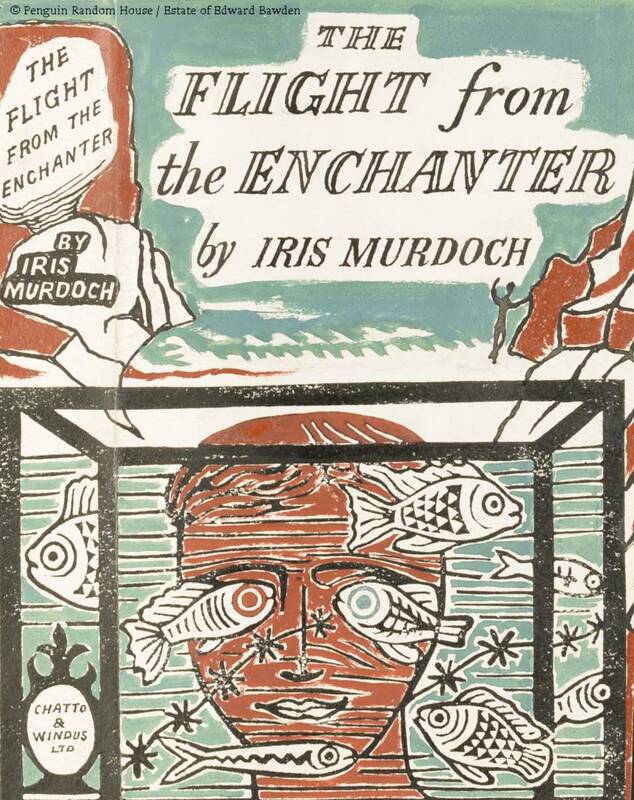 I decided to follow The Flight from the Enchanter, Iris Murdoch’s second novel, from the submission of the manuscript to the launch of the finished product to see this process in action. Chatto and Windus maintained correspondence files concerning many of its published titles, containing letters to and from the author, the publisher and other relevant parties. The file for The Flight from the Enchanter (reference CW 548/2) tells us much about the creation of this novel. Murdoch had already enjoyed considerable success with her debut Under the Net, published by Chatto and Windus in May 1954. Yet despite this achievement, she is casual on the subject of her next manuscript. Murdoch wrote to her contact at Chatto and Windus, Norah Smallwood (one of the company’s board members), on 5 May 1955. Although the letter mainly discusses her financial affairs (it seems most authors at some point write to their publishers asking for money), Murdoch waits until the final paragraph before revealing ‘By the way, I have a new novel…’ Smallwood’s reply, sent the following day, is enthusiastic: ‘I am plunged into the wildest excitement by your letter…. Of course I am dying to see the new novel’. At this time, Murdoch was combining her literary career with her post as a lecturer in philosophy at St Anne’s College, University of Oxford. In her correspondence with Smallwood, Murdoch reveals something of the circumstances in which she was working. 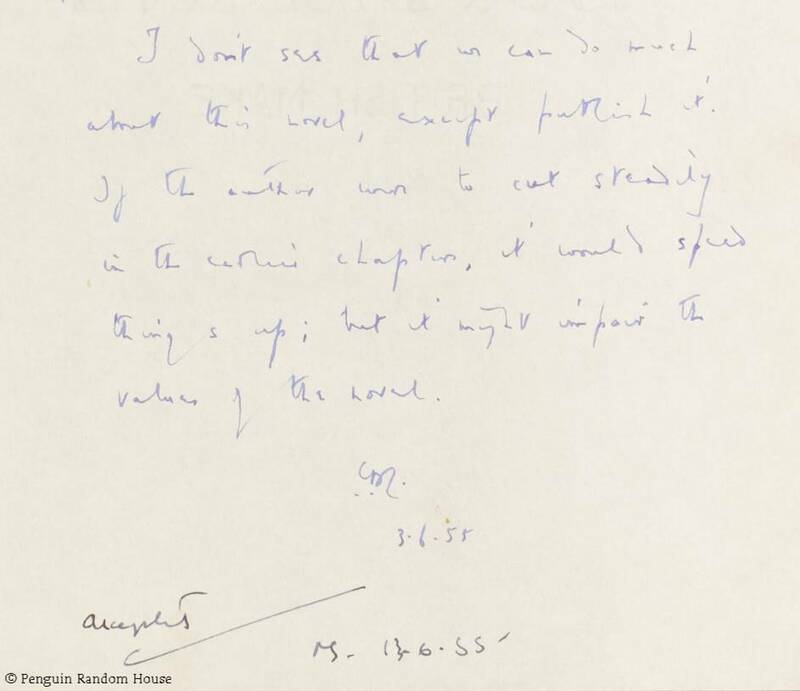 In a letter of 9 May 1955 she explains, ‘I’ll send the typescript shortly – I’d like to look through it again. Frenzied [with] philosophical papers just now’. Final page of Reader’s Report no.12833, written by Cecil Day Lewis (Series Ref. CW RR). Chatto and Windus used Manuscript Entry Books to record all newly submitted manuscripts. Murdoch’s manuscript arrived on 23 May 1955 and was given to three readers for evaluation – Norah Smallwood herself, the then chairman Ian Parsons and the poet, Cecil Day Lewis. Chatto and Windus often used authors to appraise a new manuscript, indicating the significance of the literary perspective in their commercial decisions. The resulting Reader’s Report written by Day Lewis himself (series reference CW RR) gives a mixed reaction. He begins, ‘This novel seems to me a whirl of scintillating fragments which never quite weave into a whole’. He goes on to find fault in so many aspects of the novel – some chapters drag, the plot construction is too loose and individual characters are merely ‘…bumping into one another, but giving no impression of relationship.’ There is little here to suggest that the novel will be a bestseller. So why publish? Day Lewis sees merit in the writing, stating that ‘…some of the scenes are wildly funny [and] some excellently sinister…’ but his conclusion that ‘I don’t see that we can do much about this novel, except publish it!’ is hardly a resounding endorsement from Murdoch’s literary peer. 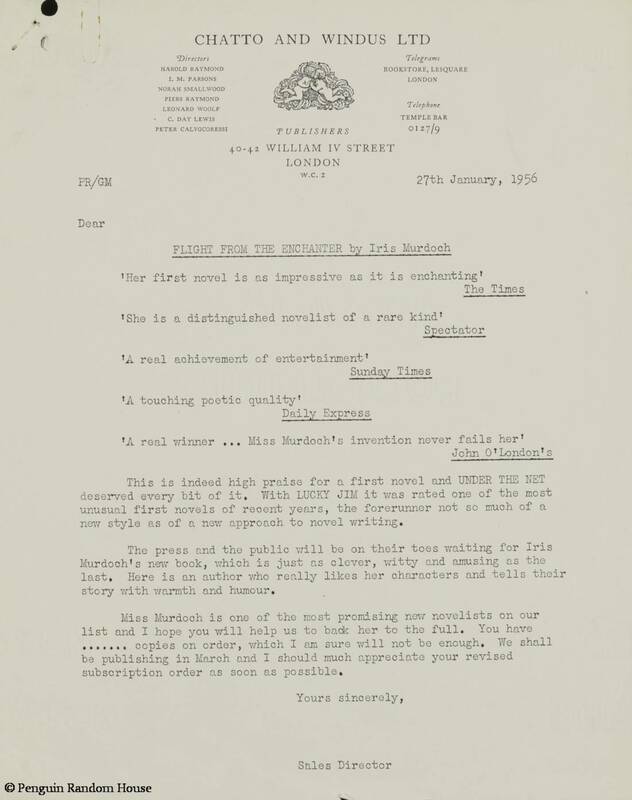 Perhaps showing the sensitivity that publishers need in their relationships with authors, Smallwood’s letter of 13 Jun 1955 to Murdoch glosses over Day Lewis’ concerns, noting all reviewers had ‘….read it with very great enjoyment. It is exciting, sensitive, at times a little sinister and on many glorious occasions wildly funny.’ The letter also outlines the proposed terms of payments for the novel. Murdoch must have been greatly encouraged. However, the same letter also makes the first suggestions for changes to the manuscript, starting the process of negotiated redrafting which characterises the relationship between publisher and author. The editorial correspondence for The Flight from the Enchanter (reference CW 548/2) shows that Murdoch was largely amenable to proposed changes, having previously been through this process for Under the Net. Nevertheless she is not lacking in resolve, especially to some of the more extensive edits suggested by Smallwood. In a letter of 2 Aug 1955, Murdoch refuses to remove one of the novel’s characters as suggested by Smallwood. The publishers, like Day Lewis, also had concerns about the series of accidental meetings between characters but Murdoch was insistent that they remain, stating that ‘They emphasise the dream-like, fairytale-like character of the book’. Manuscripts are evidently fertile ground for negotiation but Murdoch was clear on the boundaries, defending aspects that she considered integral to the text. The collection contains a series of ledgers which record the costs incurred in producing a new publication. These include profit and loss figures and author’s accounts, as well as stock books which record printing details such as the numbers of units produced (series reference CW B/2). An initial run of 5,000 copies of The Flight from the Enchanter were printed on 16 Dec 1955, costing just over £238. Chatto and Windus were staking a sizeable amount of money on the title in the hope of making a profit. This initial run was noticeably larger than that of Murdoch’s debut, demonstrating her growing reputation as a novelist. Murdoch’s subsequent books would have increasingly larger first print runs as public interest grew in her work. Press release sent to bookshops in January 1956 (from file CW 548/2). The Flight from the Enchanter was published on 23rd of March 1956 but publicity for the novel began well in advance. Stock book CW B/2/22 tells us that 75 copies of the novel were produced for publicity purposes which, along with the above press release, were sent out to various leading bookshops around Britain. The collection of advertisement books (reference CW D) shows the investment Chatto and Windus put into The Flight from the Enchanter. These are scrapbooks with examples of the adverts placed in newspapers and magazines. Like today, the adverts often used favourable quotes from other authors. In the case of The Flight from the Enchanter, these included praise from the author VS Pritchett. This delighted both Smallwood and Murdoch. In a letter dated 8 Mar 1956, Smallwood tells her ‘His opinion will influence those wavering critics, of which there are, alas, so many nowadays, who are apprehensive about pronouncing their views too definitely.’ Again, the value of the literary perspective in the marketplace is acknowledged; the critical judgement of authors can be used to commercial advantage. Chatto and Windus kept records of the critical response to their novels, adding small newspaper cuttings into a series of albums (reference CW C), and keeping longer articles in Review Files (reference number CW R). The Flight from the Enchanter received notably mixed reviews on its publication, something which Smallwood felt aggrieved by. In a letter of 9 Apr 1956 to the critic John Russell, Smallwood writes ‘To date the reviewers by and large have been chiefly concerned with condemning it for not being the book it isn’t.’ Smallwood’s belief in both the novel and the novelist is unwavering, but she must also have been concerned about sales and the impact that a commercial failure would have both on company profits and the morale of her author. She should not have worried. The Flight from the Enchanter enhanced Murdoch’s reputation. She would go on to publish many more novels for Chatto and Windus until her death in 1999. This is just one trail followed through the archives of Chatto and Windus. Their output was prodigious and diverse, and there are many more titles to be investigated. Blog post written by David Plant (Project Archivist). Please note that researchers wishing to consult this collection are required to obtain permission prior to access. Please see the Archive of Random House publishers page for more information. A famous river now becomes a stage. The Thames is now both fair and market too. One of the memorable scenes from the film adaptation of Virginia Woolf’s novel, Orlando by the director Sally Potter, shows King James I and his courtiers looking down at an apple seller woman, frozen in a macabre yet beautiful tableau beneath the ice of the River Thames, her frozen apples appearing to float around her. I was reminded of this, and other evocative scenes from the film of the frozen Thames and a ‘frost fair’, when looking at a printed keepsake from the Thames frost fair of 1684 [see image below], one of the exhibits in our current Wintertide exhibition. For all the hardship caused by a severe winter, the idea of a frost fair, described by Woolf as “a carnival of the utmost brilliancy”, conjures up a romantic, magical image of a temporary (and precarious) world set upon the frozen river, a mini city which should not be there, and I was inspired to find out more. Over the centuries, a number of severe winters have resulted in the River Thames freezing solid, particularly in the seventeenth and eighteenth centuries which became known as the Little Ice Age. This phenomenon attracted many visitors, and fairs and pageants were held on the ice, including what were to become known as frost fairs. 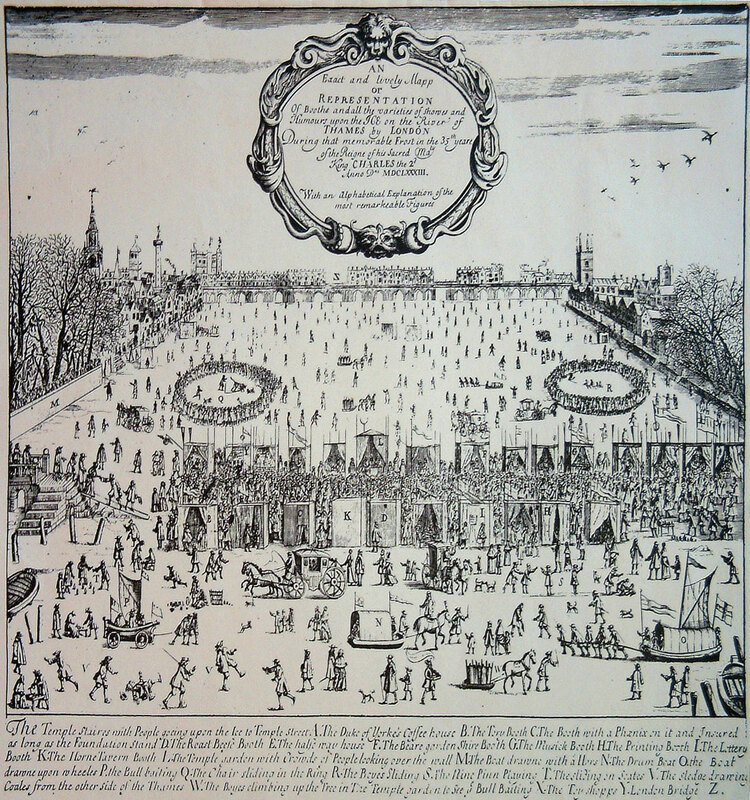 The two most famous fairs took place during the winters of 1683/84, when the Thames froze for ten weeks and the ice reached a thickness of 11 inches, and 1739/40.The last large frost fair in the City of London took place in the winter of 1813/14. A number of contemporary accounts and prints, such as the one shown at the top of this post, were produced which describe or depict the fairs and their variety of stalls and entertainments in detail. In his description in his Memoirs of the fair of 1683/4 [see image above], the seventeenth century writer John Evelyn lists “sliding with skeetes, a bull-baiting, horse and coach races, puppet plays and interludes, cookes, tipling, and other lewd places” among the entertainments on offer – even a fox hunt took place on the ice. Stalls and booths were set up selling toys and books, fruit, beer and wine, and gingerbread, and oxen and sheep were roasted. Goods were often more expensive and exceeded their ‘dry land price’. The fair of 1814 is recorded as being a lively and picturesque sight, the stalls a mass of fluttering, colourful flags, streamers and signs. Evelyn described the 1683/84 fair as a “a bacchanalian triumph, or carnival on the water”. However, as Woolf describes “it was at night that the carnival was at its merriest … the moon and stars blazed with the hard fixity of diamonds, and to the fine music of flute and trumpet the courtiers danced”. The stalls at night, teeming with noise, light and activity and the whirling and gliding of passing skaters, all illuminated by the moonlight on the sparkling ice, must have been an enchanting sight. A Press to print where men so oft were droun’d! 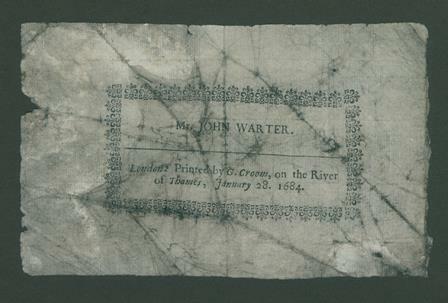 As well as the 1684 fair keepsake held in the Typography collections, we have also recently discovered a keepsake from the other famous Thames frost fair which took place in 1739/40 [see image below] in the John and Griselda Lewis Collection which we hold in Special Collections, and are in the process of cataloguing at present. The absence of a frozen Thames sufficient to hold a frost fair in the twentieth and twenty first centuries has not been due to a lack of severe winters, but other factors such as the growing size and heat of London and replacements for the London Bridge which have allowed freer flow of the river, changes which may have consigned the magical “carnivals on the water” to history. The 1684 keepsake is available to view in our current staircase hall exhibition or by arrangement with the Department of Typography and Graphic Communication. 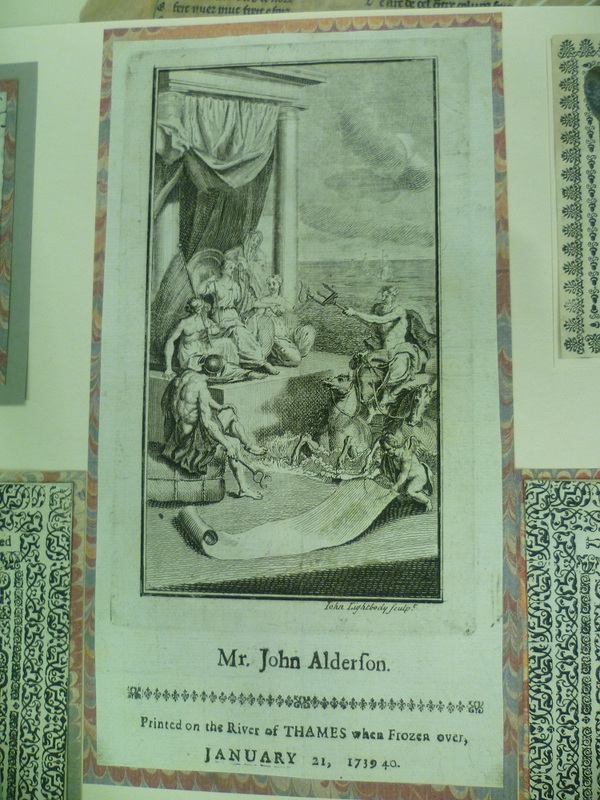 The other two items are available to view by request in our Special Collections reading room. The Wintertide exhibition, a celebration of winter traditions, customs and experiences, and the effects of the season on the natural world, is on display at the Special Collections Service from 8 December 2016 until 10 February 2017. Ian Currie. Frosts, freezes and fairs : chronicles of the frozen Thames and harsh winters in Britain since 1000 AD. (Coulsdon : Frosted Earth, 1996). MERL LIBRARY–9639 CUR.